Let’s talk about pop-tarts. 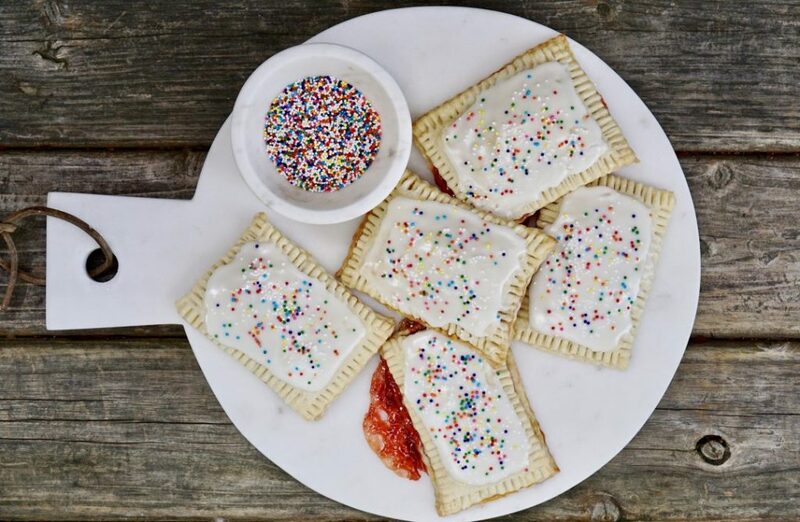 Chances are, if you were a kid growing up in the 70’s and 80’s, you not only knew what Kellogg’s pop-tarts were, you loved them. I know I loved them; not for breakfast per se, but for a snack. I was unlike most kids in that I did not like mine toasted. I liked them straight up, right out of the silver foil two-pack pack they came in. Unlike many of today’s parental food restrictions, I was allowed to eat more or less as much sugar as I wanted and to drink soda. It was a different time. In fairness to my mom, she also made me a diverse eater; maybe that’s why she allowed all the other “treats”. I ate vegetables, was a huge fan of almost any type of ethnic food and appreciated a salad–as long as it was not every night. 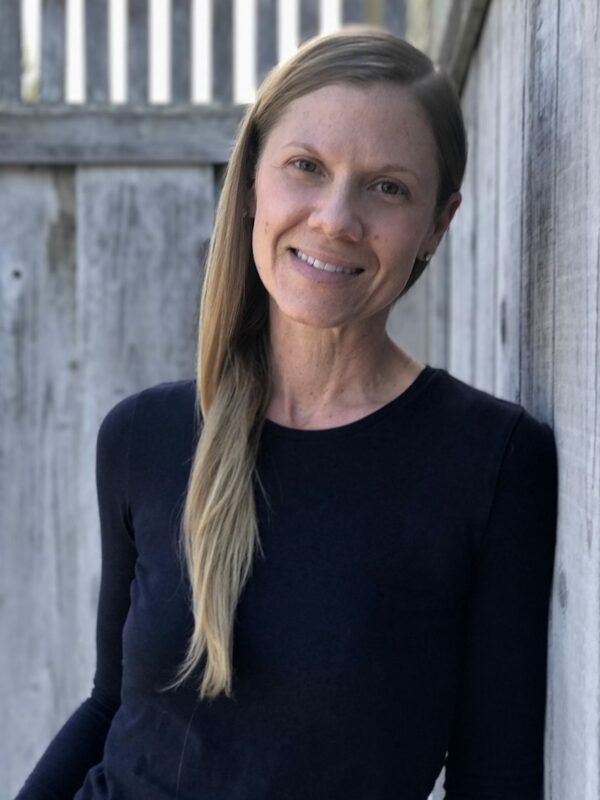 As a mom, I’m a bit more watchful of what my kids (and myself) eat, but I do preach moderation. If my kids eat well during meals, try new things and continue to eat fruits and vegetables, they can have their “treats”. 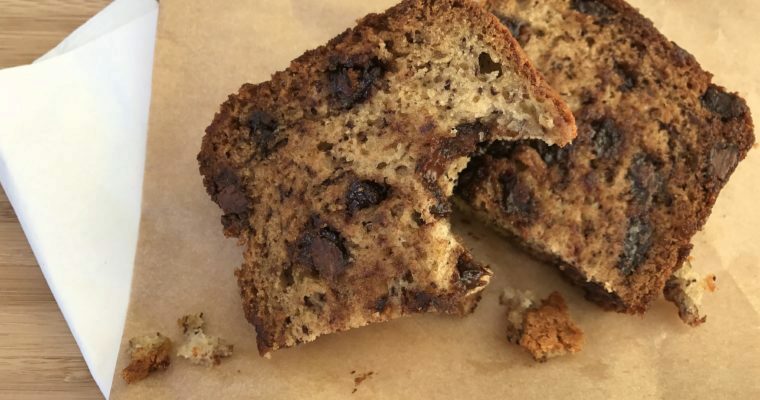 I developed this recipe for pop-tarts because my older son (the typically savory guy) asked me to buy him pop-tarts. I honestly was not sure he even knew what they were. I blame tv or possibly middle school peers! I could not, however, get myself to buy store-bought pop-tarts. And so my experimenting began. 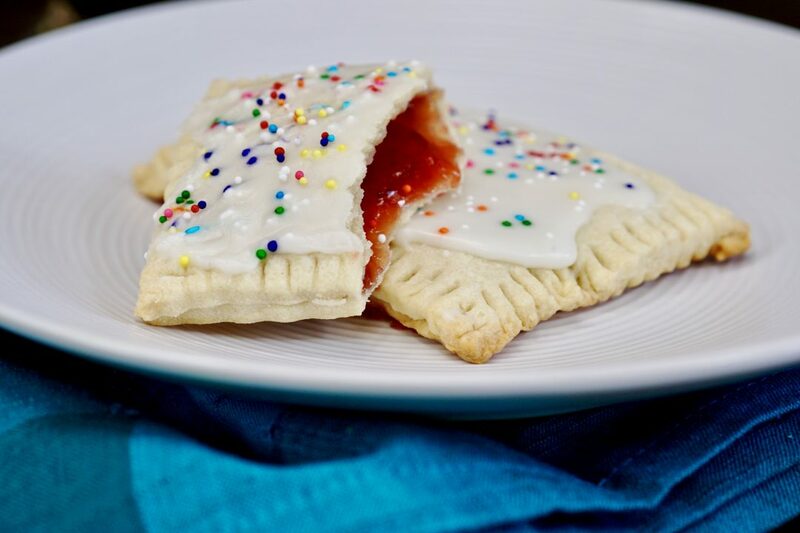 Similar to a hand pie, these are less filling and of course frosted–because any delicious pop-tart I’m going to devour is absolutely going to have frosting (and sprinkles) on it. I didn’t consult my son on what flavor he wanted, without hesitation I went with strawberry, my childhood favorite. Homemade pop-tarts take some time and patience, and you absolutely must make your own dough for this recipe. I have fallen in-love with pop-tarts all over again at 45! If you are feeling ambitious, try making your own strawberry quick jam to use in this recipe, it’s the perfect thing to make all those fresh summer berries you picked yourself. My kids loved my pop-tart, although my older son’s first remark after telling me they were delicious was “I wanted cinnamon-sugar ones”. Better to learn early on, ya can’t get everything you want in life. Step 2 For the Crust: Using a kitchen mixer such as a Kitchen Aid fitted with a paddle attachment, add the flour, sugar and salt. Blend well. With the mixer on low, add the butter. When the dough begins to come together, add the egg followed by the milk and vanilla extract. Pulse to incorporate. Step 3 Divide the dough into two equal pieces, shape into flat disks, wrap in plastic wrap and refrigerate for about 30 minutes. Step 4 For the Filling: In a small bowl add the jam, cornstarch, vanilla extract and mix well to blend. Set aside. Step 5 To Assemble: Remove the dough from the refrigerator and allow to warm up slightly. Place one disk of dough on a well floured work surface and using a rolling-pin, roll into a large rectangle about 9×12 in size about 1/8-inch in thickness. Repeat the above with the second piece of dough. Step 6 Using a pastry cutter (or paring knife) and ruler, cut the dough into smaller rectangles about 3×4 in size. You should end with 16 rectangles equal in size, which will make 8 pop-tarts. Step 7 Using a pastry brush, lightly brush the dough with egg wash. Place about 1 tablespoon of the filling in the middle of 8 rectangles. 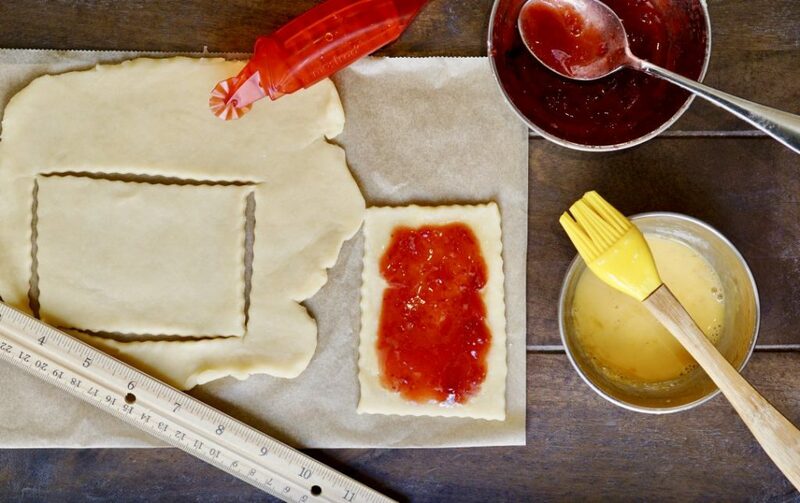 Step 8 Carefully place a second rectangle on top of a rectangle with jam on it. Repeat with the remaining rectangles until you have 8 double-sided pop-tarts. Step 9 Using a fork, gently press the dough all around the edges to seal the dough and prevent the filling from oozing out too much. 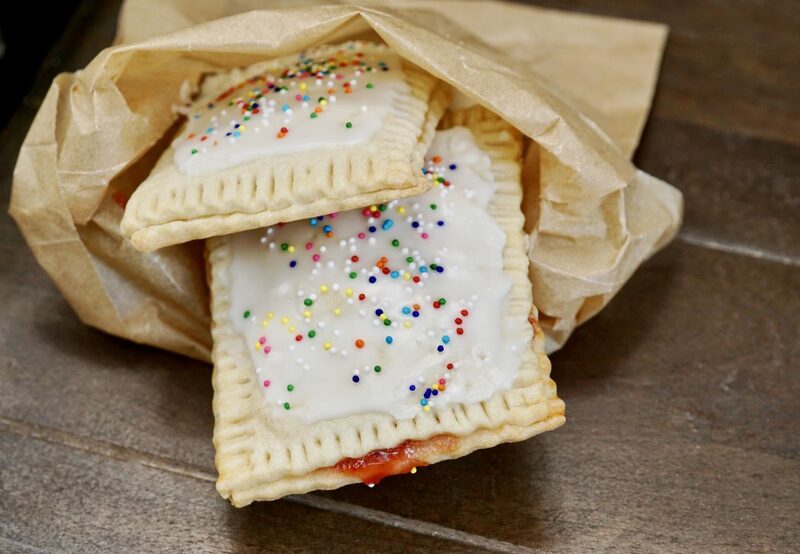 Carefully transfer the pop-tarts to the prepared baking sheets. Step 10 Using a chopstick, poke 6 holes in the top of the pop-tarts to allow for steam to escape during the baking process. Place in the oven and bake for about 15-18 minutes until firm and slightly golden in color. 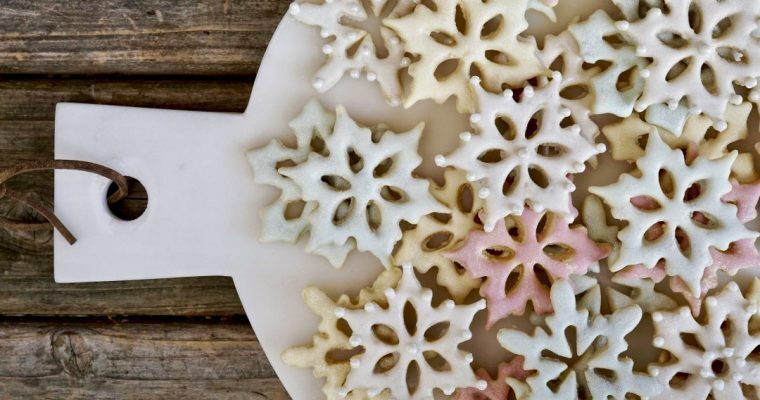 Allow to cool before frosting. Step 11 To make the Frosting: Using a small mixing bowl add the confectioners’ sugar and milk, whisk well to blend and remove any bumps. Step 12 Once the pop-tarts have cooled, use an offset spatula (or butter knife) to generously frost each pop-tart. Sprinkle with multicolored sprinkles and serve.